When advertising on traditional desktop and laptop computers marketers don’t have that big of a challenge when it comes down to display size. There are a couple of standard sizes available but for the most part that don’t vary that much. Sure, a landing page may display a bit differently from one computer to another, but it doesn’t always necessarily make or break your campaign. One of the default reporting features of iMobiTrax is the ability to view the resolution and display size of the device that clicks through your tracking link. Over the last year and a half I’ve used this important metric to optimize my landing pages and have expanded my ROI accordingly. Last month I was working with my team running a campaign and we setup a landing page just like we had before. 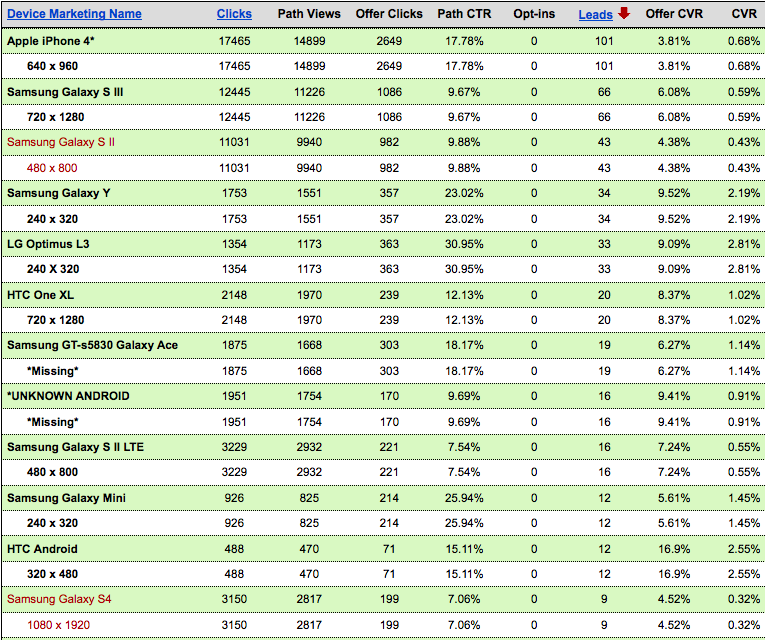 When purchasing our traffic at our source we targeted Androids, Blackberry’s, and iPhones. After the first $100 spend we were curious as to why our campaign was not performing. The traffic was hitting our landing page but they were not proceeding into our conversion funnel. What was the issue? Using live data from iMobiTrax we were able to pinpoint 90% of the traffic back to the iPhone 4. Immediately we opened up an emulator and noticed something very important. The call to action was below the fold. Our traffic was hitting the page but they didn’t know how to proceed in the campaign. While they could have scrolled down, they didn’t. The visitors were simply abandoning the page never to be seen again. 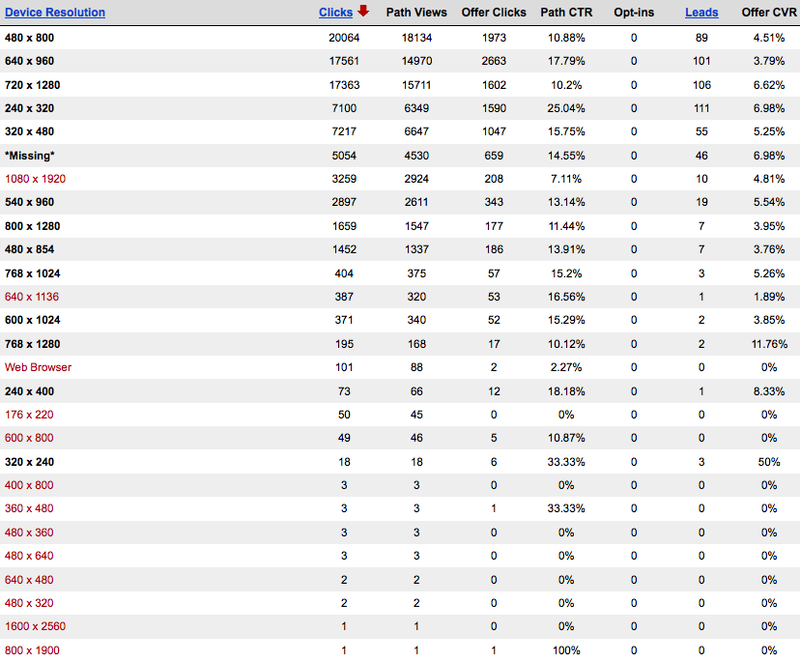 The good thing about this data is iMobiTrax reports it instantly as soon as your campaign starts delivering traffic. As in my case, it didn’t take me long to wonder WHY my campaign wasn’t converting. The traffic simply wasn’t viewing my landing page correctly and they were all leaving not converting. Once I moved the call to action above the fold and made the page where you didn’t have to scroll I began to yield conversions and produce an ROI. When you’re developing your mobile campaigns the most important thing to take into consideration is how your landing page or website will be viewed on multiple devices. There are many emulators out there (such as Device Anywhere) that allow you to preview this before you go live. In some cases it still maybe impossible to view every single device but using data from iMobiTrax you will instantly have a view about which devices are performing the best and which ones are losing you money. The advantage to doing this is you’re able to go to your traffic source with broader targeting and you’re able to bid lower for your clicks than if you were to get so granular (supply vs. demand). Using these redirection rules we’re able to buy a lot of mobile traffic in bulk and then route all the traffic out accordingly to offers/landing pages that best support certain devices, manufacturers, carriers, or operating systems. Not only are we able to add more volume to our campaigns we have full control over them! When you start your next mobile marketing campaign I want you to consider this data and look at is closely as it comes in. After the first couple hundred clicks you will be able to make some very good decisions on if your landing page is performing well on a particular device. 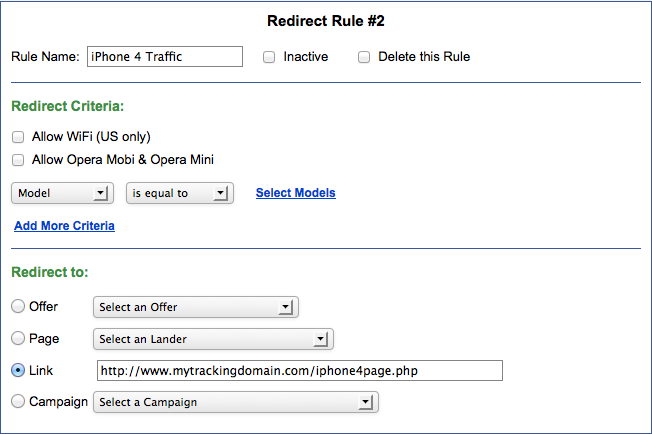 Make sure to use the iMobiTrax redirection rules to route your traffic accordingly to ensure your campaign is fully optimized for success. Happy tracking!